These five tenses are extensions of the basic tenses and totally rule the sentence formation. Using the right tense according to the situation is vital as it defines whether you can speak fluent English or not. Remember, fluent English does not mean the speed at which you can speak English, it pertains to how well you can speak English – using the correct words and flawless as per all the grammar rules, and that includes tenses as well. When you are reading a text, you totally depend on the tense used to judge the 'time' in the text. Similarly, when you are speaking or writing in English, you need to use the tenses fittingly to give your audience/ reader a clear idea of the time period you are referring to. There is a slight difference in these two sentences. Present tense refers to an action/ incident that is taking place in present time. While present perfect refers to an action/ incident that has just been completed in the present time. A perfect example of the present tense will be – I am buying the sweets. On the other hand, 'I have bought the sweets' is a good example of Present perfect. Past tense pertains to an incident that has been completed – 'I bought the sweets yesterday.' Past perfect, on the other hand, refers to a past action that was completed before another past action. This example should explain it well – I invited your brother just before the party started. Here there are two past incidences, where the former was completed before the other. 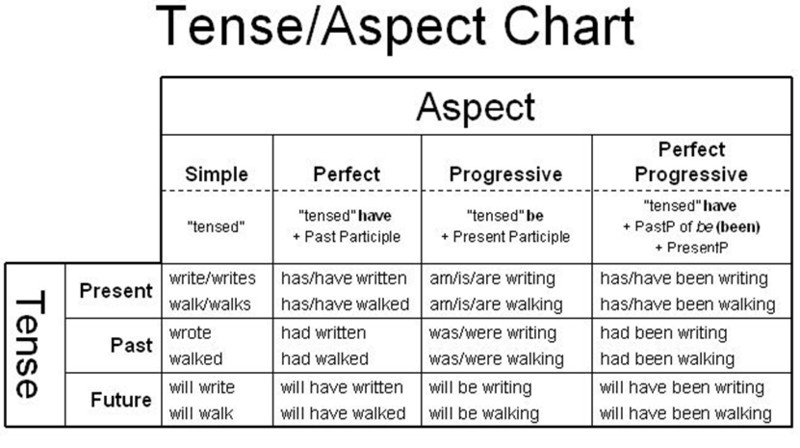 Before progressing to the other tenses, you should first practice and master these basic ones. For the remaining tenses, watch this space for our upcoming blogs! If you feel that understanding tenses is a mean task, it is better that you enroll in an online language course.The reason why online courses like eAgeTutor's Spoken English Programs are a better option is that they give you the flexibility and freedom to learn as per your schedule. If you wish to improve English skills, it is best that you study English online. 2. Me, Myself, And I – Do you know the right usage?